; ; My quiz is Bugged. Thank you for your concern. I hope at least you can fix this since all my concerns were denied by your Devs. My quiz is also bugged in exactly the same way! I tried refreshing multiple times, clearing cache, logging in through multiple browsers but nothing worked. I did have my brother login on my computer using his account (same server) and his works fine. It seems to be tied to my account for some reason. yeah me too, it is stuck. i try make new char and it is work. 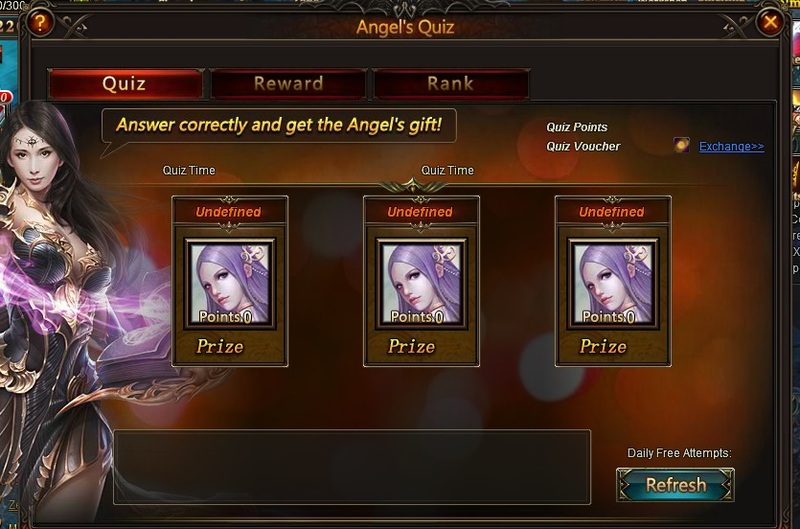 but why my char\'s angelquiz is stuck? I just tried again on multiple browsers after refreshing all cache and it is still occurring. Thank you for submitting a report regarding this issue! yes, it is still happen. 2019-4-23 00:55 GMT+8 , Processed in 0.569317 second(s), 52 queries .